29th June ’13 – Andy B Events were pleased to be involved in 2 wedding parties at the Cragwood Country House Hotel this week. Nestled on the shores of the beautiful lake Windermere & set in its own secluded, twenty-acre estate of beautiful landscaped gardens and woodland and with stunning views overlooking the lake, it’s a fabulous wedding venue! 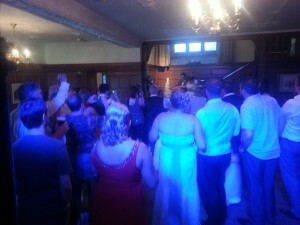 Then on the 6th July, I was providing my wedding disco for Mr & Mrs Brindle. As well as the regular wedding disco, I also provided a kids party set for the first hour or so as they had quite a few children in attendance. This included plate spinning, limbo competition, balloon modelling & a few party dances! Sam & Mark (the bride & groom), didn’t want to have a ‘first dance’. Although we did gather everyone around for the cake cutting! We then had a bit of a lull through till after the buffet. The weather was beautiful & guests made the most of it by staying out in the grounds till darkness fell. Although, apparently they could hear me quite clearly through the open bay windows as many of them complemented me on the music, now I know what a radio DJ feels like! Turned into a really pleasant evening, so all’s well that ends well! All the best to Mr & Mrs Brindle! So, if you’re looking for an experienced wedding DJ for your big day at the Cragwood or throughout Windermere, email your enquiry to andy@andybevents.co.uk As a guide, our prices in Windermere start from £295 which covers playing times of 7.30pm till 12.30am (or equivalent 5 hours). Any additional time is £30 per hour.